Akroat Ki Mithai recipe by Mahjabeensajid at PakiRecipes.com. 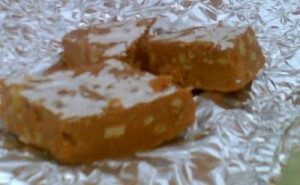 Akhrot ki Mithai is a famous sweet. Rich in nuts, Yummy and has very different taste from regular sweets. First of all slightly chop Walnuts (do not grind). Heat oil in a pan and then add cardamom powder and stir for 30 sec. Then add Nido milk powder and fry for 5 minutes. When it gets light brown then add well beaten eggs and fry again for atleast minutes. Now add Condensed milk and fry until it leaves the pan. Finaly add the chopped Walnuts and mx well. Set it aside for 1/2 an hour. Cut in slices and garnish with walnuts before serve.